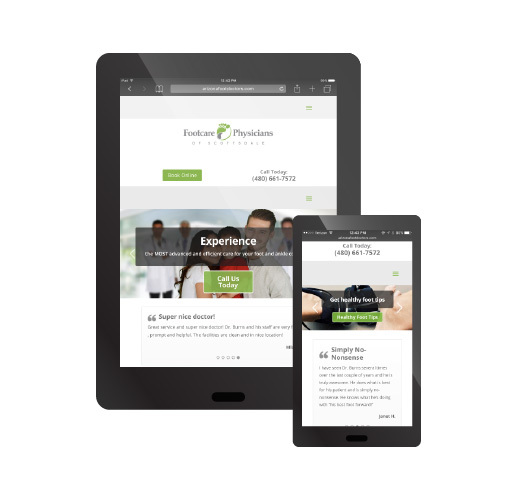 In today’s fast paced mobile world, it’s imperative that your website is mobile friendly. Believe it or not, over 55% of all website traffic originates from a tablet or mobile device. Without a mobile responsive website, you’re losing up to 55% of potential sales. We create functional, profitable and efficient websites for businesses in and around the Scottsdale, Phoenix area. Our responsive websites are built to engage and interact with your clients on smaller screens, without making them feel overwhelmed or bombarded by information. Throughout the design process, our web developers will test your website to make sure none of your content is compromised when switching between devices. Over 55% of all website traffic originates from a mobile or tablet device. To reach those customers and push more sales, it’s essential that your website is easy to use when switching from device to device. Our web design experts will build and test your website to make sure that it’s responsive in every device, without any of your content compromised.